gordon McKenzie has more than 30 years experience as a chef and now works at Bede Beaumont Catering in Dunedin.At the age of 29, Gordon was the first non European to become Executive Chef of a five star hotel in Australia – the Sheraton Alice Springs – and being a Kiwi, he remembers some very good Australian chefs questioning that! This was a real coup for the ‘small town Invercargill boy’ who has also worked in an enviable array of Hotels in cultures and countries including Vanuatu, Malaysia and Hotels throughout Australia and New Zealand. He’s also survived two major tsunamis during his cooking career – in American Samoa recently and in the Maldives at Full Moon Resort 2004.In November 2010 Gordon returned to his Southern New Zealand roots when he bought Bede Beaumont Catering, Dunedin in a partnership with Tara Namana and became Head Chef for the business. He enjoys the variety and flexibility of working in “out” catering, which allows him to plan his time around functions and spending time with his seven year old son and wife Fia who also works in the business.Bede Beaumont has a 30 year history and is the caterer of choice for weddings and events in the region. It also caters the Melbourne Cup Day at Dunedin’s Wingatui Race Course – a huge event attended by more than 7,000 race goers, providing many hungry mouths to feed at all price levels from cafe style to silver service. Mix together the marinade ingredients, add the diced chicken and leave overnight to marinate. To make the skewers, thread the red onion, bell pepper and marinated chicken along the skewer dispersing the pepper colours (thread tight or loose as desired). Lay skewers on a tray lined with baking paper and roast for 12 to 15 minutes or until cooked. 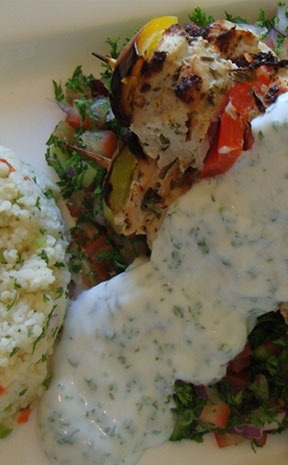 Serve with the minted yogurt dressing, couscous and a parsley mint salad. Mix together just prior to serving.